The citizens of India are casting their votes in the ongoing first phase Lok Sabha Elections 2019 which is held at 20 states and union territories. While the total number of voters' turnout will be announced by the end of today; long ques waiting to cast votes were spotted amidst tightened security across the 91 Lok Sabha constituencies. Above all, senior citizens are ruling the internet for showing a lot of enthusiasm as they have come out to vote in large numbers on Thursday. 107-year-old Sumitra Rai is reportedly by far the oldest voter casting her vote in Phase I of the General Elections 2019. If you still could not find enough spirit to go out and vote, see the pictures of all the senior citizen voters captured while voting from Phase I of polling for Lok Sabha Elections 2019. Sudarshan Pattnaik Urges Citizens to Vote for Nation’s Development With EVM Sand Art. Oldest voters such as Rai from South Sikkim, a 92-year-old senior citizen from Gondia, 104-year-old Lakhi Paul from Charaideo district, Assam, are all headlined at the moment for showing enough warmth in the first phase 2019 Lok Sabha Elections. 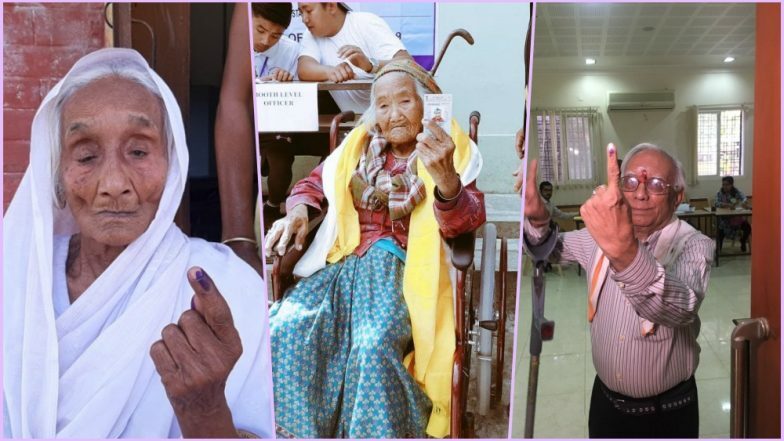 Below, check out the images of India's senior citizens casting their votes, inspiring registered voters to get that ink on their index finger as a mark of voting. Dancing Voter From Bandipora in Jammu and Kashmir is Winning Hearts on Social Media. In spite of his old age infirmities, 92-year-old Dr D.N. Sanghani was accompanied by his 60-year-old son, adhering his national responsibility to cast his valuable vote. He voted at the polling booth in Gondia, Maharashtra with his son and daughter-in-law and even urged the citizens to vote this Lok Sabha Elections. Lakhi Paul is registered as the oldest voter in Assam, who was spotted to cast her franchise in the first phase of polls on Thursday. The 104-year-old woman cast her vote reportedly at 40 No Polling Station in 105 Mahmora Assembly constituency which comes under the Jorhat Lok Sabha constituency. The OLDEST voter of #Sikkim Sumitra Rai (107) just cast her vote at Kamrang secondary school polling station at Poklok Kamrang, South Sikkim. The oldest voter in South Sikkim, Sumitra Rai arrived in a wheelchair to cast her vote during the first phase of the ongoing Lok Sabha Elections 2019. The 107-year-old senior citizen cast her vote at Kamrang Secondary School polling station at Poklok Kamrang. It was not only the above senior citizens, but also other voters who are fighting severe injuries, were spotted casting their franchise during the Phase I Lok Sabha Elections. A 78-year-old man from Noida, Uttar Pradesh exercised his right to vote even after undergoing knee replacement. Many senior citizens from Cooch Behar, West Bengal also came out to vote in the ongoing 2019 General Elections with equal enthusiasm. NaMo Food Packets Distributed Outside Noida Polling Booth During Voting. Meanwhile, independent India's first voter, 102-year-old Shyam Saran Negi is reportedly all set to cast his vote in Himachal Pradesh on the seventh phase of the General Elections, May 19. So, what's your excuse to not cast your right to vote on the Election Day?